We are a collection of artists who have come together to create new works for the theatre. 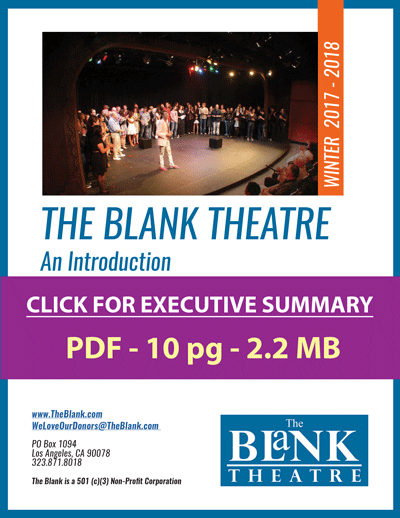 The Blank has professionally produced 296 plays by playwrights aged 9 to 19. The Blank has developed and produced close to 600 new plays. The Blank was presented with a resolution by the LA City Council to honor our excellence and commitment to the community. We want to reawaken theatre as a national pastime, and provide our community with the notion that living, breathing glimpses into human experience are a crucial part of the cultural discourse of a city and should be accessible to everyone. Help us by making a significant gift and become a Major Donor. View or download multi-page PDFs giving background on our work. © Copyright The Blank Theatre 2017. All rights reserved.